How much Delta-V would be required to escape the Gravitational Influence of the Earth without entering orbit? As impractical as it sounds (and it's definitely impractical) I was wondering what the Delta-V required to leave Earth's influence would look like if we launched "just straight up" into the Earths atmosphere. What if we kept fighting the gravity directly without the added benefit of the Earth's rotation, perhaps even having to also fight the Earths rotation. What would this be compared to the required Delta-V for the average escape velocity? You can assume any vessel build that you would like using available data, I just was looking for a ratio of Delta-V saved on orbital ascents compared to a "straight-up" approach. I want to say aerodynamics isn't what I'd like to focus on, if that isn't a required part for an approximate calculation. I've assumed a meta-Falcon 9 Full Thrust and shot it straight up on a non-rotating Earth with no atmosphere. Launching "straight up" is probably going to be much more costly. There are so many answers in this site that explain the idea that getting to orbit is about getting moving sideways fast-enough, soon-enough. Here is what happen if you don't do that. I've dubbed the mission "Falcon Nein" because even with zero additional payload, a Falcon 9 Full Thrust, shot straight up, will fall back to Earth, both the 1st stage, and unladen 2nd stage, be it African or European. A half-hour of gravity, in the absence of orbit, is horribly costly in fact. I've simulated for five "settings" of Earth gravity; 100%, 75%, 50%, 25% and zero. where where G is the universal gravitational constant, M the mass of the body to be escaped from, and r the distance from the center of mass of the body to the object. If you enter the values for the surface of Earth, you get 11.186 km/s. This formula assumes a non-rotating earth. If you want to make maximum use of Earth's rotation, you would have to launch straight east from the equator. This would theoretically save you 465 m/s. If you would launch straight west, you would need 465 m/s more. But one thing this formula does not account for is the energy you lose through aerodynamic friction while still in the atmosphere. The atmosphere makes a straight east launch obviously infeasible. That's why real world rocket launches are a compromise: You first launch straight up (relative to surface) while in the lower atmosphere, and then turn east when the atmosphere becomes thinner. It also assumes an immediate acceleration. The longer you need to reach that speed, the more acceleration you lose through falling. But these two factors are difficult to generalize, because they depend on the construction of your vessel. 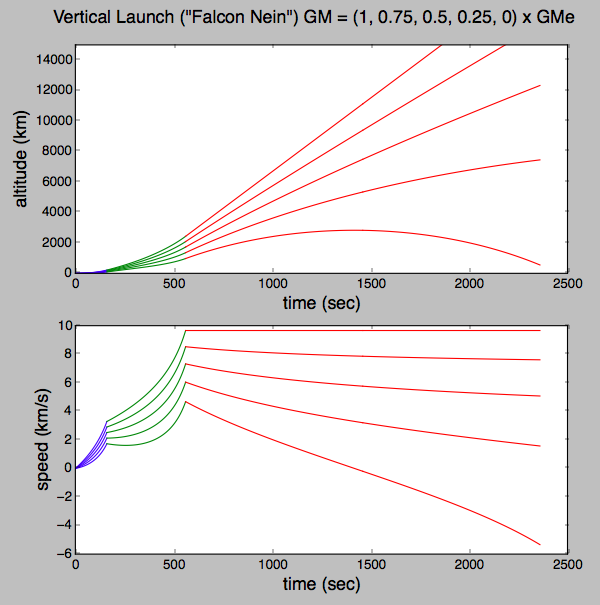 The difference (and it's a difference, not a ratio) between a direct ascent to escape, and going temporarily into a low parking orbit and then on to the same escape, is on the order of 100 m/s. That is the cost of raising the periapsis, which you would not need to do on a direct ascent. So the cost actually isn't all that much, compared to the ~9 km/s to get into orbit. This is assuming an efficient direct ascent, which still looks like going into orbit, except for not raising periapsis. You want your rocket firing to be as close to Earth as possible to maximize the Oberth effect. So you wouldn't go "just straight up", unless you could magically complete your burn just outside the atmosphere. The biggest issue here is gravity loss. If you could somehow magically come up with that 11.186 km/sec all at once (and ignoring the atmosphere) that would get you into an escape trajectory. However, in the real world it takes several minutes to build up that velocity. While you're doing that you're also expending fuel on keeping from falling back. That's pure waste. While you are heading straight up you're expending 9.8m/s^2 on fighting gravity. (This will decline as you get higher up, but the effect is small within the realm that you're operating.) Thus you tip your rocket over as soon as you can--you want to pile on as much horizontal velocity as possible as soon as possible. While it takes orbital velocity to cancel all of your weight any amount of horizontal velocity cancels some of it. Every m/s you save this way is a m/s your rocket doesn't need to provide. You have to balance drag losses from being too low with additional gravity loss by being too high. There is also normally the issue of fairings. They're big and heavy, you want to get rid of them as soon as possible but you have to be high enough that your now not-aerodynamic rocket isn't going to be a problem with them gone. This causes rockets to fly a bit higher than they otherwise would. Not the answer you're looking for? Browse other questions tagged delta-v escape-velocity or ask your own question. What if the Shuttle went straight up? How much delta-v can we squeeze out of a gravitational slingshot and what factors limit it? How can the delta-V to a specific altitude in Earth orbit be calculated? How does the delta V to reach and orbit L4 and L5 compare to entering orbit around the Moon? How does the delta v for leaving Earth orbit change in different directions from the Earth?